Not all tankless water heaters are created equally. There are huge variations in technology on the market today. The task of selecting a tankless water heater can seem a little overwhelming at first, however, the evaluation of tankless water heaters can be broken down into a few simple comparisons - once you know what to look for, the decision will be a lot easier. The single most important factor in comparing various tankless water heaters is the underlying temperature control technology - how does the heater regulate the output water temperature? This factor has the greatest impact on your day to day experience with the product, and ultimately with your satisfaction with its performance. It may surprise you to know that most models presently available on the market today use very crude technology to regulate the output water temperature - in fact, many models fail miserably in this regard for a number of reasons. The following is a brief explanation of the various current technologies. This is the most basic temperature regulation technology on the market. Units that use this technology have only one power setting (full power). When water flow is detected, these units turn on at full power regardless of the temperature rise required or the water flow rate, and stay at that power level until the water is turned off. Full on / full off models can suffer from overheating problems, consume more energy than is necessary, and are prone to premature failure when used for anything other than basic point-of-use applications with consistent flow rates. From a user's standpoint, it can nearly impossible to obtain satisfactory consistency of the output water temperature for residential and commercial applications when flow rates or incoming water temperature vary. Since these models typically represent the most simplistic and "lowest-end" technology on the market, other components in these heaters also tend to be of lower quality and accordingly, tend to further lessen the performance and longevity of these models. Recognizing the obvious shortcomings of full on / full off models, some manufacturers have created a variation of this technology that allows users to select from several different power settings. In this case, the user at least has some control over the heat output of the heater. For point-of-use applications or other uses involving near identical flow rates at all faucets, these units can produce satisfactory results. However, they are not recommended for whole house applications or other applications where the flow rate and / or incoming water temperature may change. This usually limits the use of models based on this technology to basic point-of-use applications. We do not recommend this type of technology for whole house applications or applications involving varying water flow rates/pressure (esp. well water applications!). In many cases, when running low flow applications, these units will still overheat causing the hi-limit temperature sensors to trip frequently causing the water temperature to fluctuate dramatically. Water temperatures will also fluctuate when additional faucets are turned on or off during use. More sophisticated tankless water heaters measure the flow rate of water and will modulate overall power output to compensate for the flow rate change so as to maintain a more precise temperature level. A small number manufacturers, like Stiebel Eltron, have created units with true flow-based power modulation and thermostatic temperature control. These units represent the most sophisticated technology presently available. These units are able to modulate current (amperage) to the individual heating elements as opposed to just turning them on and off. No matter what happens, the unit will adjust the power of the heating elements to maintain the precise output water temperature selected by the user. The most advanced tankless heaters in this class, like the Stiebel Eltron Tempra Series, monitor the incoming water temperature and incoming water flow rate and use a microprocessor to precisely calculate the power output required to reach the desired output. By doing this, they can regulate to the required power level very rapidly in the event of changes to the flow rate of incoming water temperature. Some competitors achieve their thermostatic control by monitoring the output water temperature and sending feedback to the microprocessor that then makes adjustments up or down until the desired temperature is reached. These units may take slightly longer to regulate and are more likely to experience problems achieving consistency when flow rates change rapidly. What makes the Stiebel Eltron Tempra Series tankless water heater the best? Set it and forget it! The Stiebel Eltron electric tankless water heater is the most advanced, flow-modulating, thermostatically-controlled tankless water presently available. The Stiebel Eltron tankless constantly measures the incoming water flow rate and incoming water temperature and adjusts power to the heating modules to maintain a precise output temperature in ALL applications (city water, well water, etc.). A convenient digital display indicates the temperature setting and facilitates easy adjustment of the output temperature by the user. Despite its high sophistication, its design is brilliant in its simplicity. The Stiebel Eltron tankless is manufactured in Germany in an ISO-9001 certified plant, engineered to last, and built with quality components. Stiebel Eltron has been in business since 1924 so you know they will be around for a long time to come. Many manufacturers utilize plastics in their case and even in their heat exchangers to save money. Stiebel Eltron Tempra Series tankless water heaters feature an attractive powder-coated steel case with convenient built-in mounting brackets, as well as copper heating chambers. Please see the internal view of the Stiebel Eltron tankless water heater (Tempra 24 shown) - see sidebar for details. 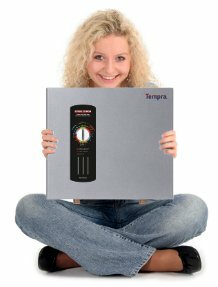 All of the Tempra models utilize the same parts and technology, but have varying sizes and numbers of heating modules. Of course, getting the best value for your money is important too. Not only does the Stiebel Eltron tankless offer the best flow modulation technology and full thermostatic temperature control, superior German engineering / quality, a solid warranty, and expert technical support, it offers its heaters at a very competitive price. How does the Stiebel Eltron tankless work? When a hot water faucet in the home is turned on, a series of sophisticated sensors begin to gather data about the rate of water flow and the temperature of the incoming water. This information is immediately sent to the microprocessor which calculates the required power output and activates the powerful heating modules. The heating modules take only a few seconds to reach the necessary power level. As the water flows through the heating modules, the water is heated. An output water temperature sensor provides feedback to the microprocessor so that it can ensure that the heater is meeting its temperature rise specifications. The sensors constantly monitor the incoming water temperature and flow rate as long as the water is being used. As these variables change, the microprocessor will adjust the power output to maintain the precise temperature setting selected by the homeowner/user. A convenient digital display on the front of the unit allows the homeowner to select an output temperature of between 86 and 125F (30 to 52C). Usually, the thermostatic control is only set when the unit is first installed - Set it and forget it! As soon as the water is shut off at the faucet, the flow sensor recognizes that water is no longer needed and the entire unit is turned off. When your hot water is not in use, the tankless water consumes absolutely no power at all, resulting in substantial energy savings. To learn more, select one of the options in the box to the right, or click Next: Compare gas and electric tankless water heaters. What makes Stiebel Eltron tankless the best? Most tankless water heaters do not feature true thermostatic temperature controls and accordingly, they cannot maintain a precise output temperature when the flow rate of water changes. They are unable to properly adjust their power output as the flow rate changes, resulting in inconsistent or fluctuating water temperatures. Many manufacturers don't tell you how their units really work because they don't want you to know that their product isn't really thermostatically-controlled at all! The Stiebel Eltron tankless water heater features true flow and temperature based power modulation and thermostatic control technology that constantly monitors the water flow rate and incoming water temperature and adjust power output so you always get the temperature you want! Set it and forget it! Well water? - No problem! Metal heat exchanger and case - no cheap plastics here!